See the Star-Spangled Banner Flag House, the home where young Mary Pickersgill worked alongside others to hand sew the fifteen-star fifteen-stripe flag that flew over Fort McHenry in the Battle of Baltimore. In the spirit of the Holiday Season, attractions in the Baltimore area invite everyone to head out the weekend of December 8 & 9, 2018 and take advantage of free or $1 admission. Dig for dinosaurs, look through the eye of the Hubble Space Telescope, take a stroll down Newton’s Alley, and all for just a buck at the Maryland Science Center. Explore the depths of White Tip Reef, marvel at the world of jellies, and experience the wonders of the world’s oceans as prices take a dive to just a dollar at the National Aquarium. Let your little ones explore the giant, three-story climbing maze, delight as they play in the Wonders of Water interactive water table, and more, as Port Discovery drops admissions to a dollar on Sunday, December 9th. $1 admission on Sunday. See the inescapable exhibit about Harry Houdini that investigates technologies, marketing prowess, and entertainment trends that transformed him into a superstar. Stay for a performance by magician David London playing Harry Houdini with a few tricks up his sleeve as he brings Houdini’s story to life, at 2pm. Come face to face with some of history’s greatest heroes including Dr. Martin Luther King Jr, Harriet Tubman, Frederick Douglass and more as the National Great Blacks in Wax museum admission is only a dollar. Step back in time to 1814 and into the home of Mary Pickersgill, home of the Star- Spangled Banner that soared over Fort McHenry and inspired the National Anthem, an experience that’ll only cost you a buck! Revolutionary War uniforms, centuries-old toys and models, and artifacts from more than 300 years of Maryland history. See it all for just a dollar! 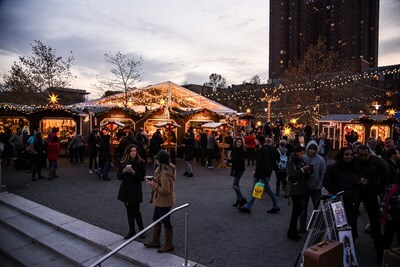 Meet Old St. Nick himself and lose yourself in a world where it’s Christmas 24-7 at the Christmas Village in Baltimore Harbor for just a dollar. Explore Maryland’s fascinating African-American heritage and experience its thriving African-American culture at this jewel of a museum during dollar days. High atop Baltimore’s World Trade Center, it’s the best view in the city, plus interactive exhibits that open up the world of the Port of Baltimore, and a tribute to the heroes of 9-11, and admission is only a dollar, this weekend only. Tour the legendary USS Constellation, the last all-sail warship built by the U.S. Navy. Man the periscope of the USS Torsk, a battle-hardened WWII submarine. Explore the expansive deck of the Light Ship Chesapeake that once guided vessels through the bay. And explore the USCG Taney, the last surviving warship that fought at Pearl Harbor. Five amazing experiences, and all for a dollar!